Castelo dos Mouros, an 8th century former Moorish castle, now a ruin c/o Christianity. Thanks Jesus! 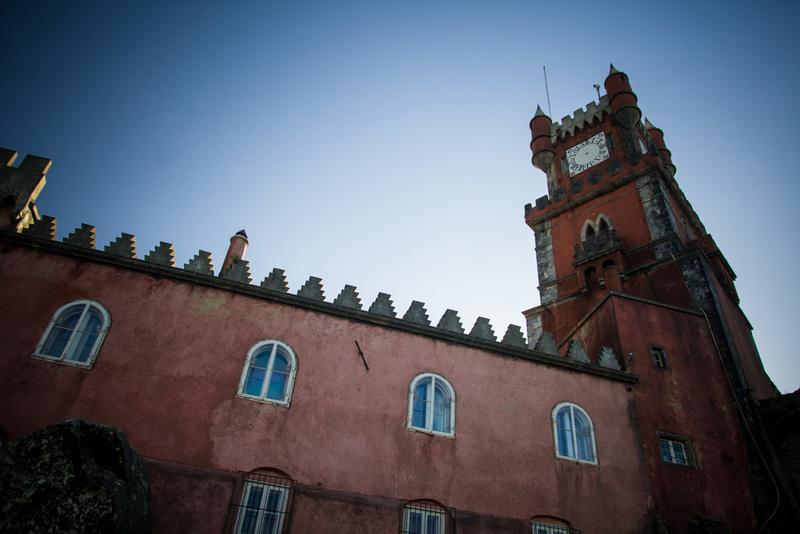 While December is one of Portugal's rainiest months, we were still blessed with some gorgeous sunny days. 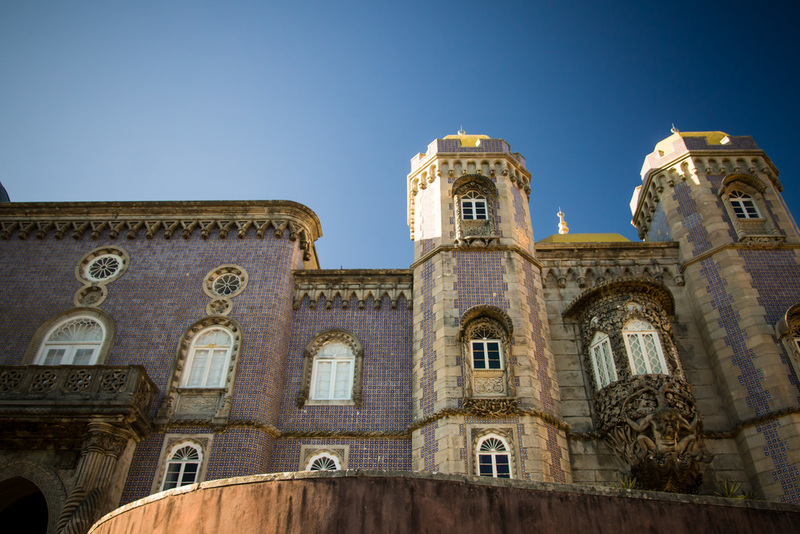 On such a day like that we decided to go to Sintra to see the royal palaces. 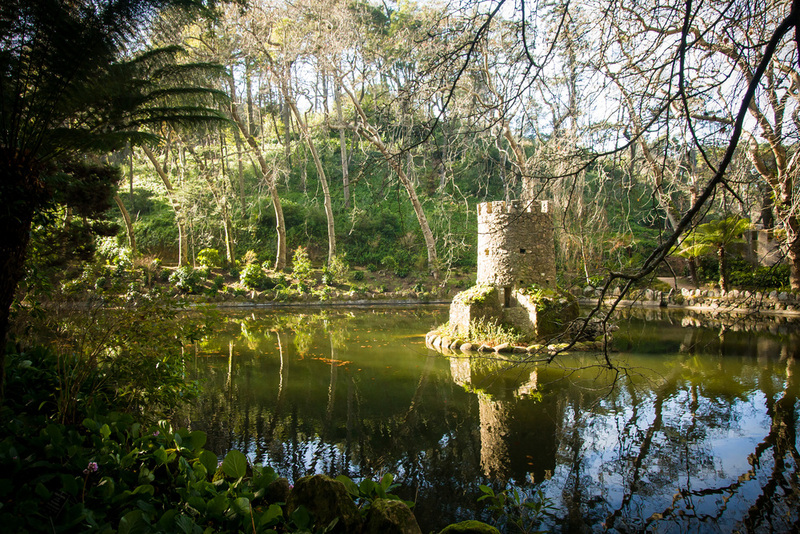 Sintra the town is also very charming, and rather than take the bus uphill we decided to walk through the gardens and up to Pena National Palace, the main palace of Sintra. I couldn't do this until I ate something, though, and through my hungry curiousity I learned the astounding fact that you can get a sandwich literally anywhere in Portugal by walking into a shop and asking for 'um sanduiche de presunto e queijo, por favor.' Even in the smallest, least likely places, the person behind the counter will produce portugese buns and fresh mild cheese from a secret, unknown location and make you a snack for around 90 cents. We wound our way up on hairpin turn roads for about an hour before reaching the lower gardens, another half hour of slow, touristy pace (ideal for photography) up to the Palace itself. We did look around inside as well - which, to be honest, is never as impressive as you think it will be. 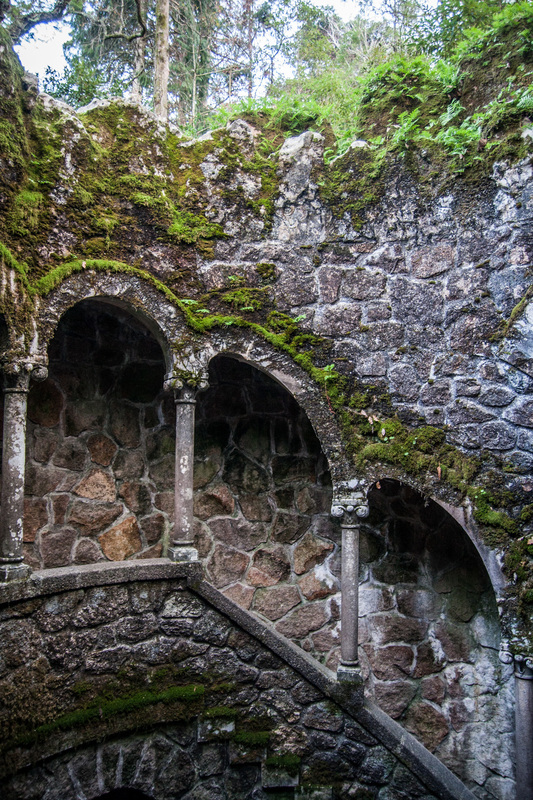 People (even royalty, apparently) lived in small, dark rooms filled to the brim with religious tchotchkes and oversized, dark, intricately carved wood furniture. Leading to an overall impression of darkness. 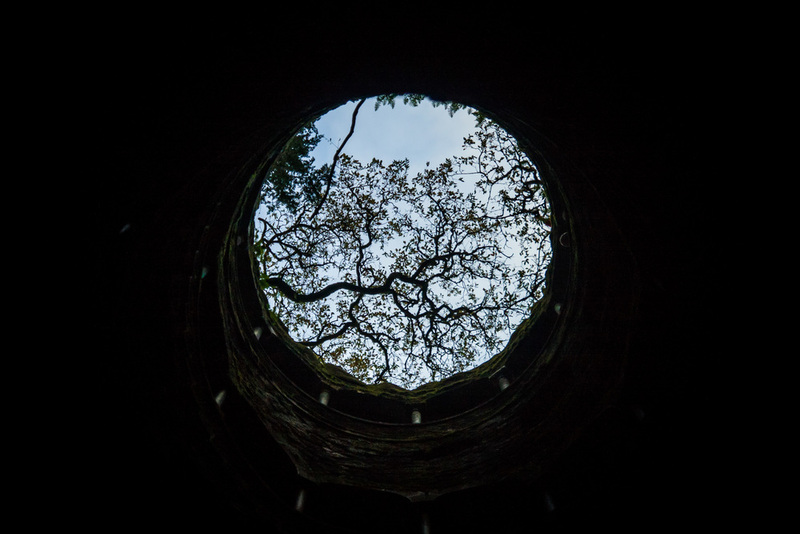 The light was starting to fade already and we rushed our way down the hill via bus to the Quinta de Regaleira, a 'small' palace by comparison and notable mainly for its gardens with underground caves, grottos, and water features. I find the gardens fascinating, conceived of to be a manifestation of the beliefs of the millionaire owner; they go from carefully maintained to lush, disorganized picturesqueness on a gradient of distance from the estate. If I were a 19th century lady, I would probably not be able to resist allowing myself to be dishonoured in such a garden. 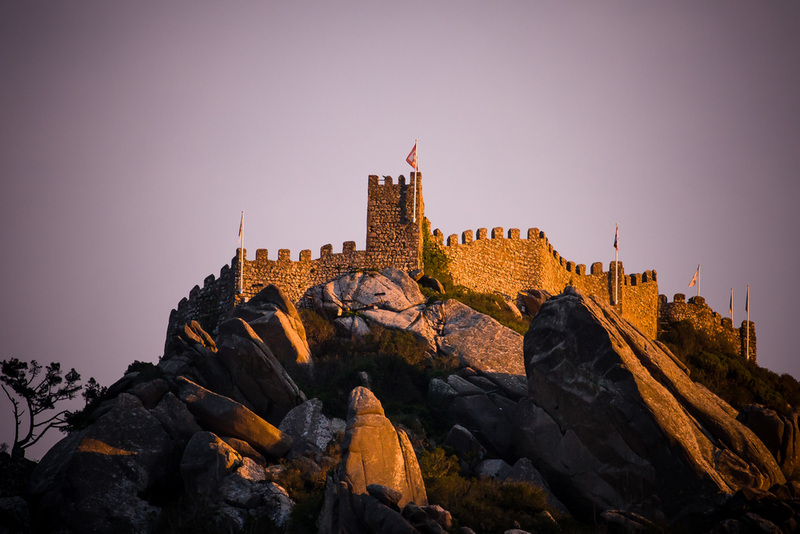 Castelo dos Mouros in the winter's evening light. We walked back in the near-dark to Sintra's centre, and stopped at a wine bar for a taste of cheese, sausage, and wine before catching the train back to Lisbon. This one time, I lived in Berlin. More stuffed birds than you can shake a stick at! Do you like gourds? Do you like bio/organic produce? Do you like whole mackerels cooked in a metal mesh net? You will love this market on Saturday morning. This camp was the first one to be architecturally designed using Nazi principles and served as a model for all other camps from 1936 onwards. Fall days and dreamy parks in Prenzlauer Berg. Grab your beverage of choice and find a sunny spot to hang out. Just got back from a crazy week in Montreal, followed by a crazy overnight trip with my office to documenta 13. For now, just some pictures from our new apartment and area. How to have a series of perfect days in Berlin, if the weather co-operates. If you are in Berlin and it is hot, I recommend you make your way to the train and head'er straight to the lake. There are many lakes around Berlin, but Schlachtensee is said to be the cleanest and most scenic. We didn't need to be told twice on a hot May holiday: we packed up our towels, sunscreen, and snacks and headed west on the S1. Get your hoes out, or just visit the Prinzessinnengarten in Kreuzberg. PLUS, in what probably should be a separate post, the Chapel of Reconciliation by Peter Sassenroth. From the mitte to the Berlin Wall Memorial along Bernauer Strasse. Nobody rains out my staycation. Unless it is the sky. Historic reconstruction (i.e., the German propensity to complain about anything remotely interesting in architecture), coffee in too-cool Weserstrasse, and second-hand English books in Berlin. The topography of terror is apparently very, very flat and stony. Also, holidays are successfully making me not want to return to work.